If you're partial to the ramblin' solos of the Allman Bros, with a dash of Clapton and the languid, laid back charm of J.J Cale, then you should hitch a ride with this Italian trio. This is their second album and sees them build on their debut. Much like Moriccone did, taking the western and giving it a spaghetti western spin, E.Z Riders do a similar thing; taking their version of American and UK blues rock and adding their own (pepperoncini) spice. The band excel when they stretch out and solo as on the title track and the all instrumental 'Far Away' which, over its generous nine minutes, is like Lynynrd Skynyrd jamming with early Santana and is probably the best track on offer. The solos here rely on the melody slowly building, creating a compelling dynamic that those great 70s bands did so well. 'What it's Worth' also has a Skynyrd riff, and adds some good gob iron and a tasty solo that's topped off with a Jack Bruce vocal delivery. There are wider influences on 'Dust In The Wind', again with a nod to Skynyrd, but the track sits on a bass rhythm that's very reminiscent of Booker T and the MGs' groove on Albert King's 'Oh, Pretty Woman'. A reggae riff on 'Let Me Be Your Man' adds to the flavours and broadens the core bluesy material. It's a classy, well played 70s indebted blues rock album but it's not a totally smooth ride. There are some bumps on the road, mainly due to the vocals. Shared by Alessandro Alessandrini and Luigi Ridolfi, while serviceable, aren't nearly as proficient as the guitar playing and lessen the overall effect of the record. While they have that world weary timbre (think John Mayall) that works so well with the blues, sometimes the vocals sound less like they're expressing emotional upset and more like they're conveying stomach upset. A new singer or more attention to the vocals is needed here. The likes of Clapton or Gary Moore weren't initially great singers but they became good singers through perseverance. Hopefully, the same will be said of E.Z Riders. 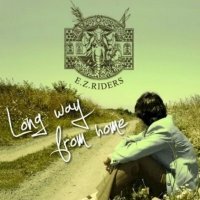 Still some way from home, but for lovers of blues rock the road ahead looks good for the E.Z Riders.